JAMES W. JETT, ESQ., is one of the prominent and wealthy farmers of Bond County, who has seen almost all of the wonderful development and growth of this section, and one who has been an important factor in the same. He was born in Oldham County, Ky., December 27, 1824, and was the son of William B. Jett, who was a native of Virginia. Grandfather Jett was a farmer in the Old Dominion, a descendant of English ancestors, and a soldier in the Revolutionary War, and in that State he died at an advanced age. The father of the gentleman of whom we write was a shoemaker by trade, and he settled in Kentucky when a young man and there he married. He landed in this county between Christmas and New Year's Day in 1834, having journeyed from Louisville to Evansville by boat and from there by wagon to this place, where he took up Government land and settled on "Jett Prairie," in Mulberry Grove Township. Here he built a double log house and followed shoemaking for some time but finally devoted all of his strength to farming. He improved eighty acres here and had it well cultivated at the time of his death in 1854. The mother of our subject was Clarissa Parker, who was a native of Indiana and became the mother of ten children, five of whom grew to maturity: George W., Owen, Henry C., Elizabeth and James W. The mother died at the age of forty-eight years and both she and her husband had been members of the Christian Church. In his political faith, he had been a Whig and was a man who commanded the respect of all. Our subject had reached the age of ten years when he came into this county, and his first schooling was received in a little log schoolhouse, where the chimney of mud and sticks was picturesque even if it did smoke, and the writing table was a slab against the wall. The logs had no chinking between, so there was no difficulty about ventilation in those days, and happy and hearty were the pupils, and from out that simple schoolhouse have gone men like our subject, strong and sensible in mind and capable of conducting the affairs of the county and State. Deer and wild turkeys did not have to be sought in those days, as they came by the cabin doors, and often has our subject shot both without leaving home. Wolves were troublesome and destructive, and precautions had to be taken against them. The marriage of our subject took place in 1847, when Miss Pernecy Smith became his wife. She was born in Kentucky, came here about 1840 and became the mother of eleven children, of whom the following yet live: George W., Henry B., Isaac N., Mary J., Laura, Agnes and Ida. John, Thomas, William and a daughter unnamed are deceased. Our subject settled upon his present farm in 1849, and built a small frame house and has here made all of the improvements. 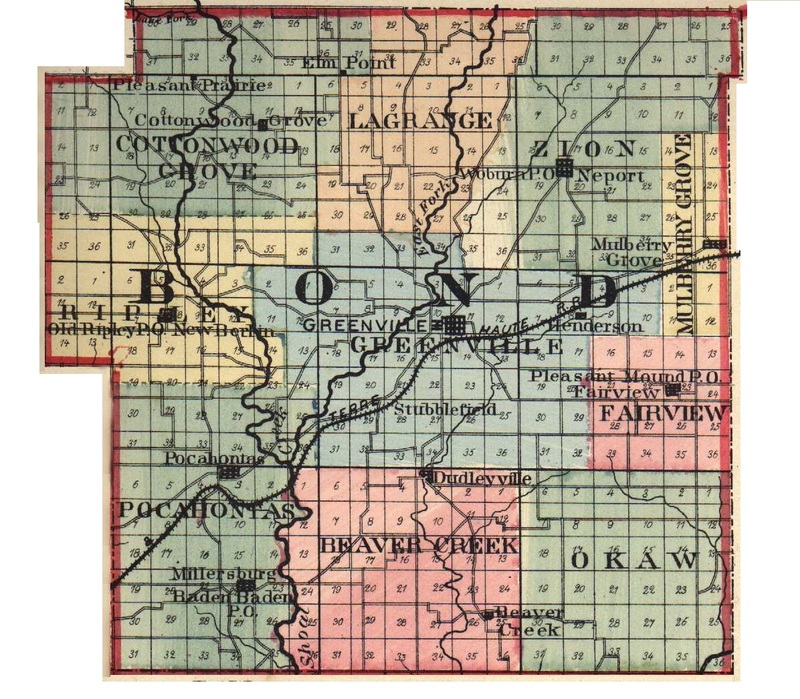 He has been a hard worker and now has the satisfaction of owning three hundred and thirty-five acres of land, upon which he has raised great crops of grain and many head of stock and has made a success of both having fully proved the fertility of Illinois land in Bond County when properly cultivated. Both Mr. and Mrs. Jett are members of the Christian Church, and to its support he has liberally contributed. In his political belief our subject is a Republican of the deepest dye. He knows well why that is his faith, for no one in this part of the State is better posted upon public questions. The political history of the country with which he is familiar would do credit to the position of a statesman. Mr. .Jett has filled some of the important offices of the district, as for three years he was a Justice of the Peace and has been one of the School Directors. Extracted 21 Dec 2016 by Norma Hass from 1892 Portrait and Biographical Record of Montgomery and Bond Counties, Illinois, pages 484-485.